Jason Snell recently explained how to use Applescript to automate the popular Twitter client Twitterific. 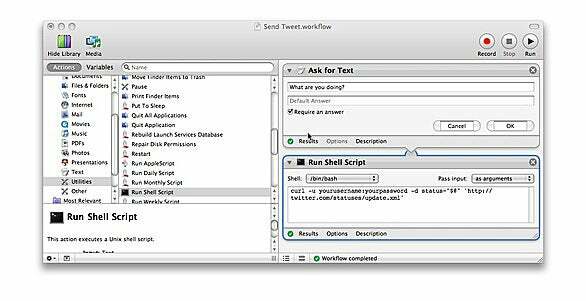 But, with the help of some simple shell scripting, you can also send quick status updates directly to Twitter from within an Automator workflow. This script uses the command-line utility curl to send a status update to Twitter. Be sure to replace ‘yourUserName’ and ‘yourPassword’ in the script with your actual Twitter username and password, and to use your own custom status message. (Don’t forget to keep it to 140 characters or less!) Once you’re finished, just run the workflow to post the message. Adjust the first field in the Ask for Text action to whatever you want. (I use, "What are you doing?") In the Run Shell Script action, set the Pass Input drop-down to As Arguments and insert your own username and password in the script. When you run it, this workflow will now prompt you for a status update, which it will then post to Twitter. Pass a text argument to the Run Shell Script action, to customize the messages it sends to Twitter. You can insert any action that results in text before this modified Run Shell Script action. For example, you could create a workflow that uses the Find People with Birthdays and Get Contact Information actions to send out birthday greetings to friends on Twitter. You could even save a workflow like this as an iCal alarm plug-in, to be run automatically on a daily schedule. That will loop through all the text input messages and pass them along to Twitter individually. And this is just the beginning of what you can do with curl and Twitter. For a complete list of supported commands, including usage examples, visit the Twitter API documentation wiki.